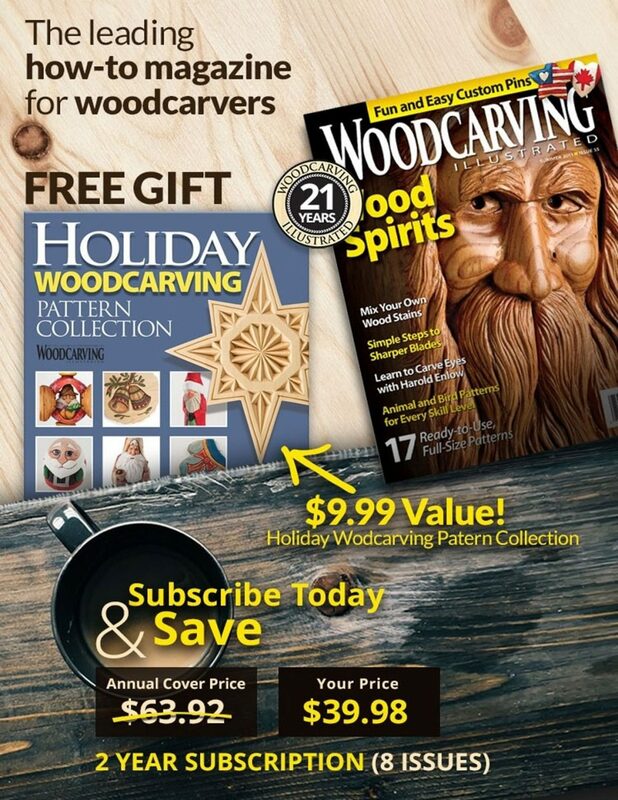 This review was originally published in Woodcarving Illustrated Summer 2018 (Issue 83). Flexcut has added three spoon carving tools to its extensive range of carving equipment: two Sloyd Hook Knives and the Spoon Carvin’ Jack. Together, they ensure that spoon carvers both at home and on the go are fully equipped for their art. “Sloyd” refers to an old Scandinavian concept of handwork and an educational system intended to teach crafts holistically, as part of a well-rounded education. 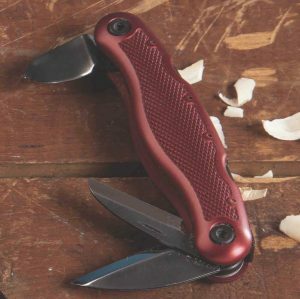 These days, the word calls to mind a simple, sturdy, multipurpose knife designed for carving or whittling. to strop, let alone sharpen. In fact, these tools are so sharp that I was hesitant to use the Double Bevel Sloyd Hook Knife. I rest my thumb on the tool to push it through the wood while I carve, and that isn’t possible with this knife. It would be very useful for larger projects, like bowls or even large serving spoons, where the carving motion comes from rotating the wrist rather than pushing with the thumb. For a small spoon, however, I found myself constantly shifting my grip on both the tool and project, trying to get the right leverage while avoiding the sharp bevels. However, I really liked the Single Bevel Sloyd Hook Knife. I could push it easily through the wood in my preferred grip. I appreciated the deep curve, which fit well into the smaller spoons I was carving. I found that I used different areas of the curve depending on the part of the spoon I was carving. The Single Bevel Sloyd was easy to use, fit my hand well, and cut through my hardwood blanks cleanly. I did not experience problems with the sizes of the handles, suggesting that carvers will need to test the handles to see if they suit your hands (and consider sanding them to size as needed). Left-handed carvers should also be aware that the single-bevel hook knife may be uncomfortable to use and consider the double-bevel version instead. 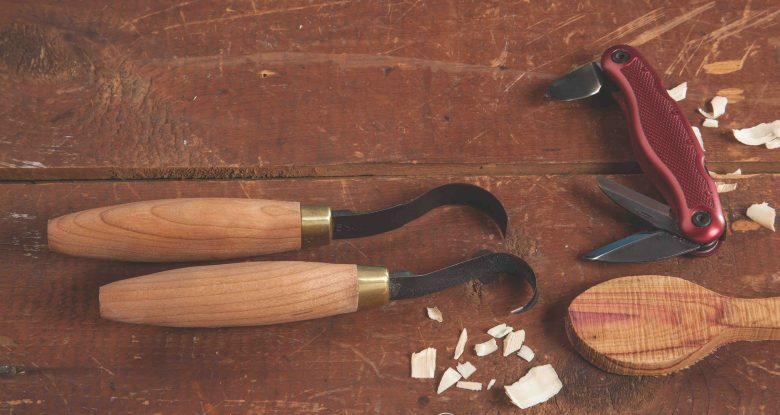 While carving spoons seems like an ideal “whittling” activity, most people don’t carry a curved blade along with their pocketknife. Shaping a spoon bowl with a straight blade is challenging and time consuming. Enter the Spoon Carvin’ Jack, Flexcut’s newest folding knife. The 6″ (15.2cm)-long body contains three locking blades (one straight and two curved) that arrive sharp and ready to carve. Together, they enable carvers on the go to shape both the handles and bowls of spoons. The body of the knife is made of ergonomically shaped aerospace aluminum that’s comfortable to hold and has a solid, if slightly heavy, feel. It is cross-hatched for improved grip. This is a brilliant idea. In practice, while the radiuses of the two blades match those of the Sloyd hook knives, I did not find them as easy to use as the full-size versions. The curves are fairly slight in such short blades, making it harder to dig deeply into the spoon bowl. That said, if you simply carve shallower spoon bowls when you’re working in the wild, the Spoon Carvin’ Jack will enable you to whittle by the campfire to your heart’s content. It’s a small price to pay for the portability, safety, and convenience of an all-in-one spoon tool that will fit in your pocket or pack. The suggested retail for the Single Bevel Sloyd Hook Knife is $74.95, the Double Bevel Sloyd Hook Knife is $79.95, and the Spoon Carvin’ Jack is $124.95. Visit www.flexcut.com to order or to find a local retailer. 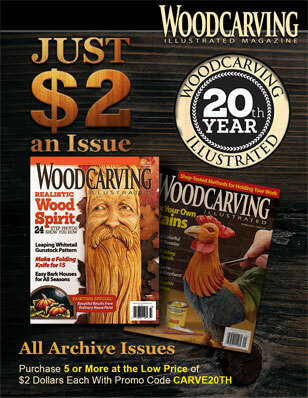 To subscribe to Woodcarving Illustrated, visit www.woodcarvingillustrated.com/subscribe.